Rare opportunity at this oceanfront home in the desirable north end of Salisbury Beach! Inside, a large eat-in kitchen opens to a spacious living room with a picture window staring straight out to the water. A full bathroom is also on the first level. The second level has 4 good sized bedrooms. Enjoy the outdoors on the gorgeous wrap around covered porch with impeccable views of the ocean where you can step right out to the soft sandy beach and feel the ocean breeze. All of this comes in the perfect location just far enough away from the hustle and bustle of the Salisbury Center, but close enough to take advantage of the entertainment, restaurants, and new boardwalk. 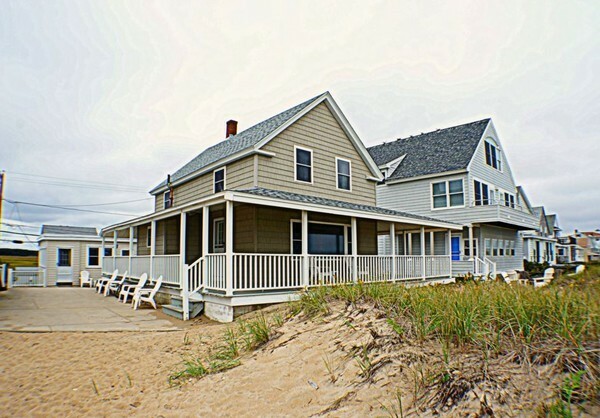 Great potential to add value and/or keep as investment with great summer rental history. Both homes on lot are being sold as condos. The other unit offers 5 rooms, 2 bedrooms and 1 full bathroom. Condo docs to be recorded prior to closing. Currently being used as seasonal. Exterior Shingles Exterior Unit Feat.